My roommate has a cupcake machine. It’s bright red, shaped like a waffle iron, and resides in our kitchen. I laughed when she told me about it. How often are we actually going to make cupcakes? More importantly, why does it require a separate machine? The oven covers massive baking territory. 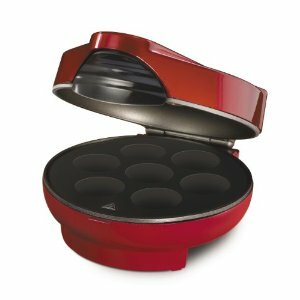 After some further investigation, the most hilarious thing I discovered about the cupcake machine was that it claimed to be a highly versatile product. It can make muffins, too! And muffin-shaped eggs! And muffin-shaped pancakes! The advertisements’ claims couldn’t be more antithetical to its highly-specific mission of baking cupcakes. I wasn’t surprised that such a machine existed, but I was fascinated by it. Infomercials constantly announce devices that serve intensely specific functions. In the world of kitchen gadgetry, an asparagus peeler is a brilliant idea, not a waste of space. An avocado-cutter was featured in a recent issue of O Magazine. I know someone who owns an ice tea maker. But this raises the question: why is there a market for having separate gadgets for every vegetable, pastry, and beverage that comes along? I think this culture of kitchen gadgetry might be a uniquely American thing, a reflection of our fiercely individualistic culture that worships specialization. Because of this obsession with specialization, waste is conflated with wealth on a daily basis. Inflexibility is equated with genius. Division is mistaken for perfection. Here’s the problem: waste isn’t wealth. Inflexibility isn’t genius. Division isn’t perfection. This, I feel, is something fundamentally problematic with such societal values: they’re unsustainable. Claire, how did I not know that you’re not only a rad story-writer, but also spit mad anti-capitalist social theory in a clear and straightforward way?! Well done, homie. Next Next post: Could you please repeat the question?